Queensland is known for hot weather and hot women and there no better place to soak it all up then in Brisvegas! When the suits head home on a Friday Brisbane’s CBD comes alive, and there is no shortage of hot spots in the Valley! We’ve sourced the ultimate 4.5 star bucks party accommodation located smack bang in the middle of the city. Choose from both one or two bedroom apartments, all of which are self-contained and the perfect place to rest your dizzy bucks party head! From Southbank to the Valley, dawn to dusk, Brisbane to Brisvegas, day and night time activities in Queensland’s capital are endless. Races, Karting, Sailing Cruises, Paintball, poker… whatever you fancy, we will arrange them for you. One night to one month, whatever your budget, whatever your style, the Wicked Bucks team have all your Bucks Party accommodation needs sorted. 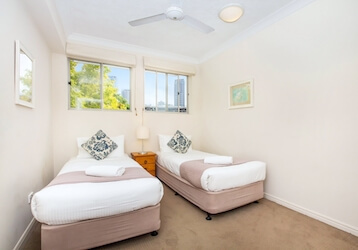 Budget style accommodation in prime Brisbane CBD location. Only a short walk from the nightclubs even the Buck will be able to stumble his way home at 4am. This property may come with a budget price tag but it doesn’t skimp on its facilities. Spacious rooms, in-room wifi and an onsite cafe to cure that hangover, this is the perfect option for Buck’s groups wanting a premium experience at a fraction of the cost. Spacious and comfortable our two bedroom apartments are a fantastic option for Buck’s looking for a little hint of luxury. With a large living area, these apartments are the perfect space to regroup after a day of activities or to host your own in-room party. 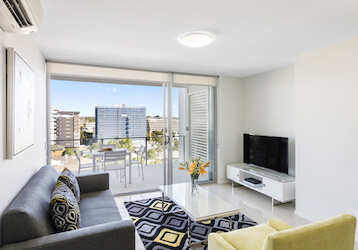 Cook up a storm in the fully equipped kitchen, enjoy a hungover morning in front of the TV watching Foxtel and in-house movies, keep connected with Wifi access then pop over to the onsite pool. Our two bedroom apartments are versatile, luxurious, and only a stone’s throw from all the action!